Salut, my cherished music video family! It’s Andy Gesner and the staff from HIP Video Promo, back with another fantastic video from one of the best-loved acts in indie rock. 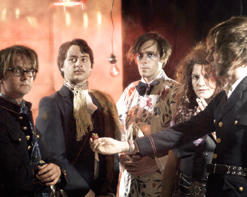 It’ll be a busy summer for of Montreal – never in the ten-year history of the band has it been so popular, or so well-respected. Hissing Fauna, Are You The Destroyer?, the latest album, has been hailed as a raw, emotionally explicit masterpiece by the rock press, and seems destined to be remembered as one of the vital, must-have releases of 2007. Kevin Barnes and his band will be touring Europe through June, and returning home to take a coveted slot at the Pitchfork Festival in Chicago. Now, on the heels of the criminally-catchy “Heimdalsgate Like A Promethean Curse” (“come on, chemicals!”) comes “Suffer For Fashion” – a piece of immediate and irresistible power-pop that might just vault this group of lovable oddballs onto the Billboard charts for the first time. Thanks to Scandinavian animator Sigrid Astrup, they’ve got a clip for the song that merits some serious attention. Now, of Montreal videos are always wildly imaginative – who could forget the cartoon chaos that accompanied “Wraith Pinned To The Mist”? – but they’ve outdone themselves this time around. Astrup specializes in the art of creating the illusion of movement through sequences of still pictures, and, in the process, investing ordinary household objects with an eerie significance. If you recall the stop-frame pixellation that appeared to make the vegetables in Robyn Hitchcock’s classic clip for “Balloon Man” dance across a butcher’s block, you’ve got a pretty good idea of the technique, and how engrossing it can be. In the “Suffer For Fashion” clip, Astrup takes the method much farther, playing with textures and incorporating other animated effects, and projecting images on small screens-within-screens that never seem to stand still for long. Astrup also gives us footage of of Montreal in their element: onstage, in costume, and bathed in electric stagelight. These glimpses are rare, and precious – occasionally she wipes away her backdrops and presents the band in a full frame, and at the close of the clip, the animation crumples up like a piece of old newspaper, revealing Barnes before the microphone in a shirt of light. But generally, the group is shown playing on a piece of paper or shard of glass – a small fragment of a menagerie laid out on a flat surface. Rubber-gloved hands penetrate the walls of the frames and manipulate the objects: painted shells, hammers, masks, flowers, marbles, swatches of fabric. They’re arranged in fantastic shapes, turned upside down, made to comment on each other, and used to tell a story written in the language of household items. The stop-action filming and pixellation is so frantic that the clip takes on some of the elegance of Japanese ikebana – but instead of arranging flowers, these gloved hands are making a dazzling and well-balanced artistic display out of the sort of objects you might find in your bottom drawers. They are, therefore, a perfect accompaniment for of Montreal’s music, since Barnes has always seen the potential in unfashionable sounds, and made fantastic and mystifying sonic sculptures out of pop fragments. Big props to Matt Lunsford and Seth Hubbard at Polyvinyl for bringing us another winning clip from their unrivaled roster! We have also gotten our hands on more copies of Hissing Fauna, Are You The Destroyer? for all of your on-air giveaway needs! If you need more info, call Andy Gesner at 732-613-1779 or e-mail us at info@HIPVideoPromo.com . You can also visitwww.PolyvinylRecords.com, or www.ofMontreal.net to find out more about of Montreal.